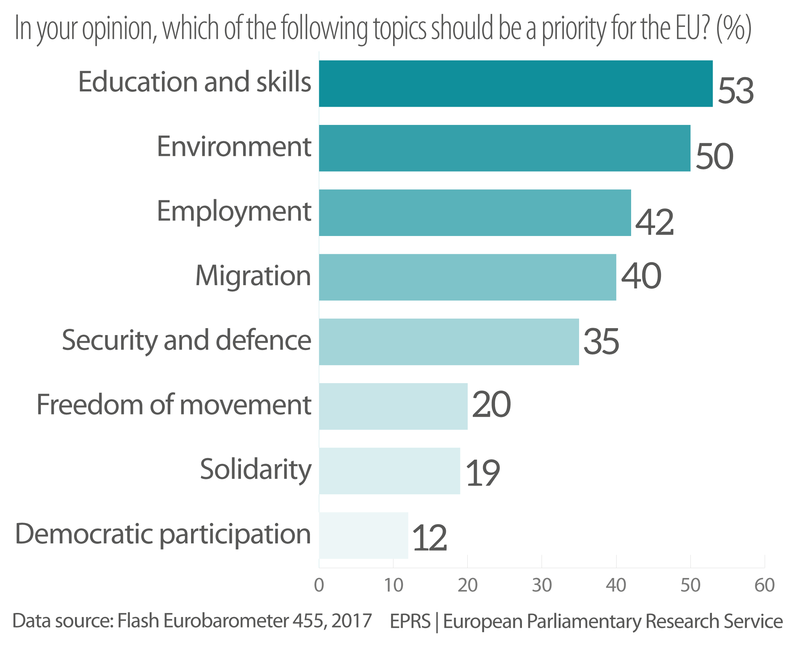 Flash Eurobarometer 455 asked young people to identify a maximum of three topics (listed in Figure 1) which should be considered a priority for the EU. They also had the possibility to suggest other topics, indicate ‘none’, or choose ‘do not know’. These latter options are not displayed in the graphic, as ‘none’ received 1 % of the responses and the other two options received 0 %. ‘Education and skills’ attracted the highest response rate (53 %), followed closely by ‘environment’ (50 %) and ’employment’ (42 %). ‘Freedom of movement’, ‘solidarity’ and ‘democratic participation’ were the topics that attracted fewest responses. These percentages are EU averages. Figure 2 shows the breakdown of the response for education and skills by Member State. At the upper end of the range are Bulgaria, Hungary, Romania and the United Kingdom, where 63 % of the respondents identified ‘education and skills’ as a priority. At the bottom is Slovakia, where 40 % of respondents chose this topic. However, according to the survey, this percentage is a joint second with ’employment’ in Slovakia, while ‘environment’ scored highest at 46 %. It is interesting to note that young people’s top priority for EU action is an area for which actual responsibility lies legally with the Member States, even though the EU has specific targets it wants to reach by 2020.